Which affordable Fitbit tracker is better value? For a long time, Fitbit's bread and butter was fitness trackers. They were so important to the company that it had a number of them. That's changed in recent years as it's moved towards smartwatches like the Versa. Fitbit has got rid of the majority of its fitness tracker range in favour of the Inspire and the Inspire HR. They're two fitness trackers that (mostly) do it all. They're waterproof, cover the tracking bases and are affordable to boot. But there are two of them, and choosing between them can be difficult. Which one is better for you, and why? We've spent some time with both devices, and here we've put them head-to-head to help you figure out which one is best for your wrist. If you don't notice a difference between the Inspire and Inspire HR we don't blame you. They look like exactly the same device, and for the most part they have all of the same pieces, but there are differences. The primary difference is that the Inspire is slightly thinner than the Inspire HR, largely because the Inspire doesn't have a heart rate sensor built-in. This isn't the biggest deal in the world, and we didn't notice too big of a day-to-day difference in our review, but it is something to look out for, especially if you care about device thinness (or if you wear a lot of long-sleeved shirts). The other major difference is in the strap type. The Inspire HR has a watch clasp, which offers a more secure fit. The regular Inspire uses a button clasp, which we found is more easily undone by doing things like taking off your jacket. The button clasp doesn't always come undone, but if you want a 100% secure fit all the time, without the fear of your fitness tracker coming loose, the Inspire HR is the better option here. Otherwise, the two fitness trackers are identical. They both have OLED displays that are bright and easy to see. They're both waterproof up to 50 metres and they both have the option of using either straps or clips, which you need to purchase separately. Another difference is colour. The Inspire only comes in all-black or a purple-ish red, while the HR comes in black, pink and purple, and white and black. Overall, the regular Inspire might feel a tad better on your wrist, though it may not stay as securely on your wrist as the Inspire HR. 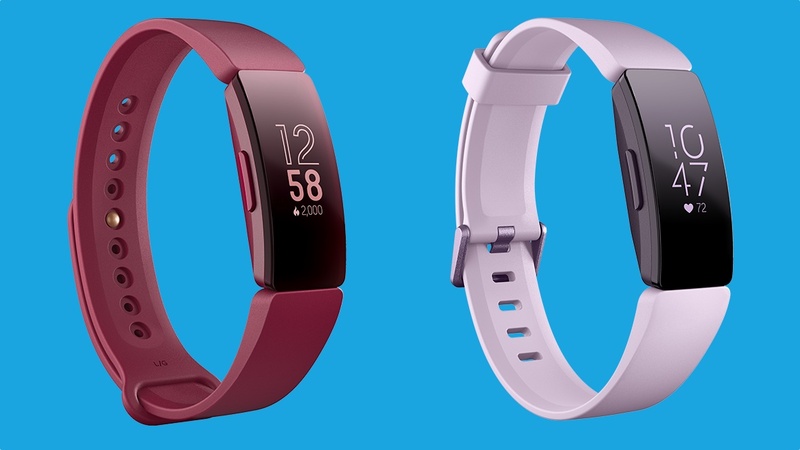 We should also mention that if you were a fan of Fitbit's clip-on trackers, the Inspire is the only tracker that will give you the option to wear it away from the wrist via an optional accessory. The largest feature difference between the Inspire and Inspire HR is right there in the name: the Inspire lacks a heart rate sensor with 24/7 heart rate monitoring. That's a major difference, and it allows the Inspire HR to have a couple more features. Keeping track of your heart rate throughout the day is the obvious one, but another major loss for the Inspire is advanced sleep tracking. You'll still get basic sleep tracking, which is still something Fitbit is very good at, but you're going to miss out on Sleep Stages, which requires your heart rate. That means you're not going to be able to see how long you spend in light, deep and REM sleep every night. It also means you're not going to get sleep insights. This is a big loss, especially as it's a feature available on every other new Fitbit device. You also won't be getting Guided Breathing on the regular Inspire, as the heart rate is also used to sync your breathing pattern in the app. Similarly, goal-based exercise modes are out. If you want to set goals, you'll need to pick up the Inspire HR. Another loss in the fitness realm is Connected GPS. While it isn't exactly built-in GPS, Connected GPS allows you to use your phone to track where you are and what you're doing. This can be valuable if you do a lot of outdoor running or cycling, but it's not present on the Inspire – it's only available for the Inspire HR. Those are some massive misses on the regular Inspire, and it's what makes it more of a basic fitness tracker compared to the Inspire HR. Otherwise, the two fitness trackers have a lot in common. They both have the swim tracking metrics that were first introduced on the Flex 2. You'll also get step tracking, calorie tracking and activity tracking. Notifications are also on board, as is Fitbit's very good automatic workout detection. There are a lot of similarities, but when it comes to some of the more advanced fitness tracking stuff, you're missing out a lot without that heart rate monitoring. You'd think that the Inspire would have better battery life than the Inspire HR, as it doesn't have a sensor consistently tracking your heart rate – but you'd be wrong. Both the Inspire and Inspire HR have the same exact battery life: five days. Now, the regular Inspire will likely have a little more room in that five days, such as longer days, and you could probably stretch it to six days. The Inspire HR, however, likely won't get better than five days. As for price, the regular Inspire will cost you $69.95 while the Inspire HR will cost you $99.95. For that $30 you're basically getting a heart rate sensor and clasp. What do you want in a fitness tracker? If you want a device that keeps track of your basic activities and offers things like waterproofing and some sleep tracking, then the Inspire is a good choice. If you're looking to spend the least amount possible on a Fitbit, it's a solid option. However, the Inspire HR isn't that much more expensive. And for the extra cash, you're getting a whole lot more thanks to that heart rate sensor. You're getting some major feature upgrades, especially when it comes to sleep tracking. Plus, you're getting a better clasp. While the button clasp on the regular Inspire doesn't come open too much, over the long term it could be a big annoyance. So the Inspire HR could offer a better pound-for-pound value compared to the regular Inspire.